Dr. John Gallagher attended Saint Joseph's University and received a Bachelor of Science Degree in 1978. Following that, Dr. Gallagher attended Hahnemann University Medical School where he received his medical degree in 1982. He completed his Otolaryngology and Head and Neck Surgical training at Thomas Jefferson University Hospital 1987 and has been practicing Otolaryngology since that time in the Bucks County area. Dr. Gallagher is Board Certified in Otolaryngology and Head and Neck Surgery. He is a Fellow of the American Academy of Otolaryngology and Head and Neck Surgery, and a member of the American Board of Otolaryngology. He is a member of the American Medical Association and the Bucks County Medical Society. Dr. Gallagher has served as President of the medical staff and as Chairman of the Department of Surgery at Saint Mary Medical in Langhorne Pennsylvania. He has been a member of the Board of Saint Mary Medical Center. He has been President of the Board and presently serves on the Board of the Bucks County Medical society. He is currently a Delegate to the Pennsylvania Medical Society. 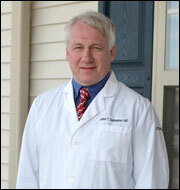 Dr. Gallagher resides in Bucks County with his wife and family.